Like it or hate it, Flyers general manager Paul Holmgren wants Jeff Carter in Orange and Black for years to come. In a report by CSNPhilly.com’s Tim Pannacio, Holmgren and Carter’s agent, Rick Curran, have been in productive discussions to extend the 25-year-old upcoming restricted free agent. The Tampa Bay Lightning wanted nothing more than to take home a win in Philadelphia for former Flyers and current Lightning forward Simon Gagne. It’s safe to say Gagne left his old hometown happy. Pavel Kubina’s goal early in the third period would serve as the game-winner, as Tampa Bay handed Philadelphia it’s first regulation loss of the season, 3-2, Thursday night at the Wells Fargo Center. On Thursday night at the Wells Fargo Center, the typically hateful Philadelphia crowd stood and provided a loud and emotional cheer for former Flyer and now Tampa Bay Lightning forward Simon Gagne, who made his first return to the city he played in for 10 seasons. The tribute video, thanks to The 700 Level. The video debuted during a TV timeout in the first period and was followed by a standing ovation and curtain call by Gagne. When you think of Philadelphia Phillies ace Roy Halladay, the NHL is likely the last thing that would come to mind. But with a little over a minute left in the Montreal Canadiens – Pittsburgh Penguins game on Saturday night, Habs forward Scott Gomez did his best Halladay impression. With time running out in the 2-2 contest, Gomez, 30, skated down the wing well into the Penguins’ zone. Gaining the edge just slightly on defenseman Kris Letang, the Alaska-native appeared to have fired off a left-handed a wrister toward MA Fleury. But instead of come off his stick with velocity, the puck simply trickled through the goalie’s pads and in, winning the game for the Canadiens. It wasn’t pretty, but it also could have been worse. 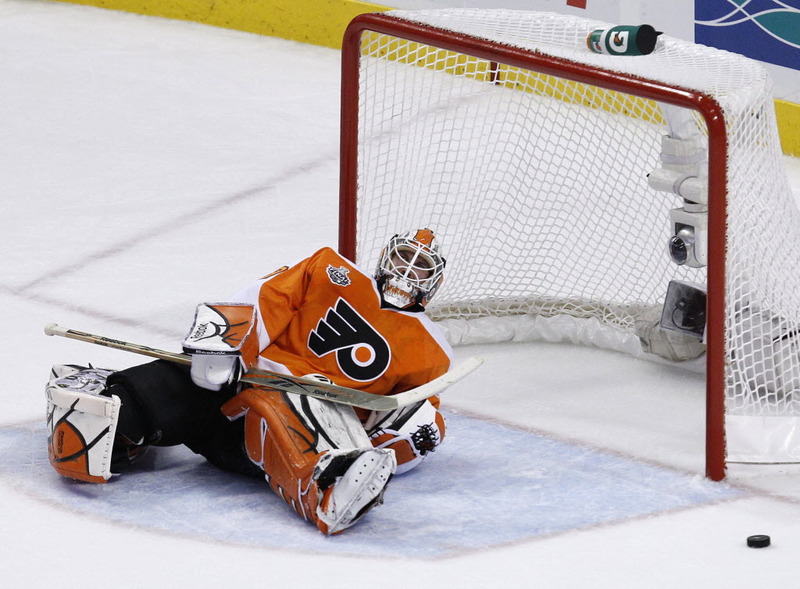 After being dominated for a full two periods, the visiting Flyers scrapped together a third-period goal from Danny Briere, before falling in overtime to Carlo Colaiacovo and the St. Louis Blues, 2-1, at the Scottrade Center on Saturday night. The Flyers’ goaltending fears turned into reality on Friday afternoon, when general manager Paul Holmgren announced that starting goalie Michael Leighton, who signed a two-year, $3.1 million contract in the offseason, will undergo lower back surgery to repair a bulging disc that turned herniated. He is expected to miss a minimum of 6-8 weeks.